If you're accustomed to boring and casual Sunday nights watching Netflix, get ready for something a bit more enthralling happening tomorrow: The National Weather Service predicts that an Aurora Borealis might be visible on Sunday night from certain northernly locations in the United States and Canada, meaning that stunning streaks of light might dart across the sky. Do you live where the #Aurora may be visible Sunday night? According to the NWS map, the Aurora will be visible throughout a pretty broad swath of the North America, but especially so in the Midwest, New England and eastern Canada. The phenomenon, also known as the Northern Lights, is the result of a solar storm. It's a common occurrence in Scandinavia. 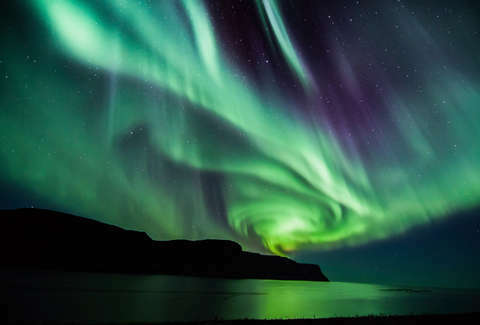 The Northern Lights become visible when electrically charged particles released by the sun are pulled into Earth's atmosphere by magnetic fields, where they collide with neutral particles, resulting in one of nature's most brilliant displays. It's one of the world's seven natural wonders, so it should be difficult to overlook if it's happening above your house. This is one of the rarer instances in which the Northern Lights creep down into a lower part of the northern hemisphere. On the other side of the globe, New Zealanders are often treated to the southern hemispheric equivalent of the event, which is called the aurora australis, or the Southern Lights. If you can't wait until tomorrow and would like a mesmerizing primer on how the Northern Lights look, check out this timelapse of the event cascading over a lake in Denmark. Moving forward this summer, there'll be another chance to catch a different mesmerizing solar event: The Great American Eclipse -- a total eclipse in which the sun is completely blocked by the moon -- is happening on August 21, and will be visible to naked eye for millions of Americans.